With the permission of the Immanuel United Church Council, the Ministry Profile Committee is calling a congregational meeting for Thursday, April 13 at 6:00 p.m. At the meeting, congregational members will have the opportunity to respond to the Ministry Profile Report and to vote on the Motions/Recommendations of the Ministry Profile Committee. The report and the recommendations will be made available for review after worship on Sunday, April 9, or failing that, by email on Tuesday, April 11. In addition, copies of the report will be available at 5:30 before the meeting on Thursday, April 13. Please mark your calendars to attend this important meeting. 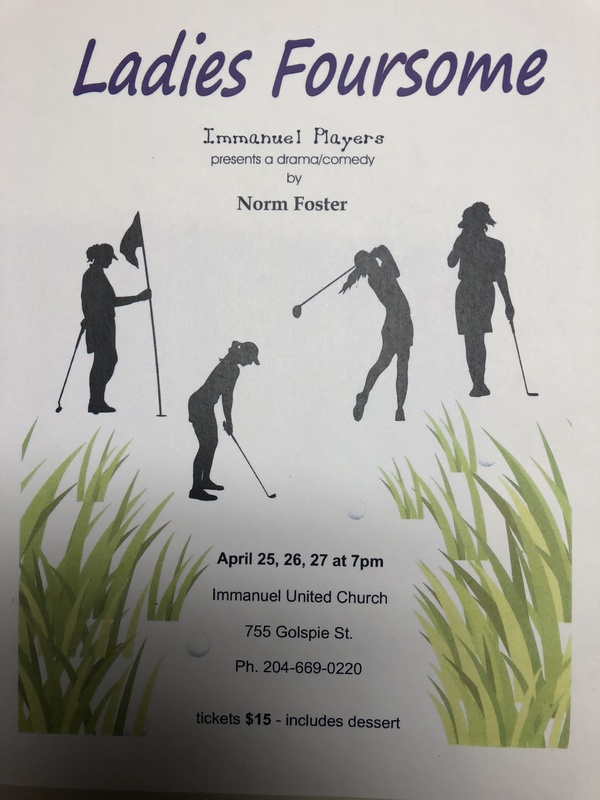 Immanuel Players are at it again! This year’s dessert play is “Things My Mother Taught Me”. It will be performed at 7:30pm on April 20th, 21st and 22nd. Please spread the word to friends and family. Tickets are $15 and available in the AMEN corner or contact Sharon in the office. Oak Table Spring Dinner 3 at Holy Rosary at 510 River on Saturday, April 29th with honoured guest Elsie Hughes. Reception at 6pm, dinner at 6:30pm. Tickets are $50 with a $30 Tax Receipt. After dinner entertainment and dinner catered by DeLuca’s. For tickets contact: Oak Table Office at 204-416-2240, Cindy at 204-895-8599 or email: oaktable444@shaw.ca . See poster on bulletin board. Friendly Reminder Please remember to let Sharon in the office know if you are wanting to use space in the building for meetings, etc. Annual Report Submissions are due by Monday, April 24th. Please email to iuchurch@mymts.net or bring into the office. Retirees Luncheon will be held on May 2nd from Noon – 2pm. You are invited to our final luncheon before summer for food and fellowship. Our special guest will be Jordan Rogodzinski, a grade 12 student with cerebral palsy from Miles Mac Collegiate to share his experience of having his own Sports Show, the behind the scenes of preparing for it and the interviews with sports personalities that he has done. Please see sign up sheet for approximate numbers in the AMEN corner. Hope to see you there!